Engagements Managers create proposal teams by issuing Invitations to Participate to the individual(s) who will be working on the bid response. NOTE: if you are an Engagement Manager (accepts Invitations to Bid) and wish to also access the bid documents and work on the bid response, you will have to invite yourself, too, as described below. NOTE: Invitations are sent via email from the address 'notify@decisiondirector.com'. Sometimes invitations will get caught up in junk mail. Please be sure your team and email administrators add 'notify@decisiondirector.com' to their whitelist. 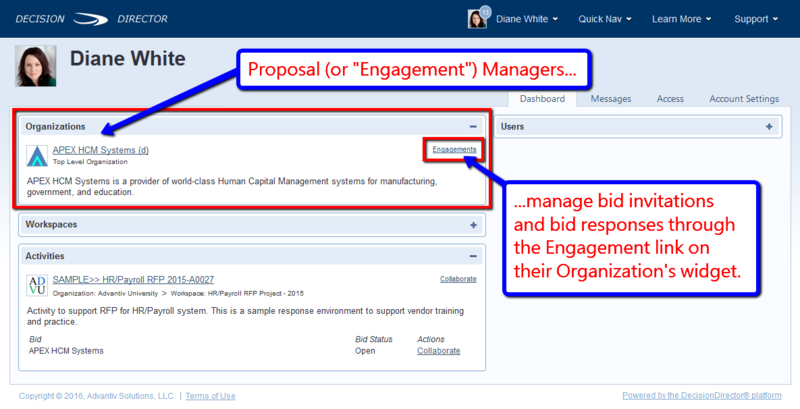 From the Engagement Manager's dashboard, the Engagements link will lead to the place where bid invitations and responses are managed. Invitations to Participate are issued through the Active Engagements link on the Engagements tab. 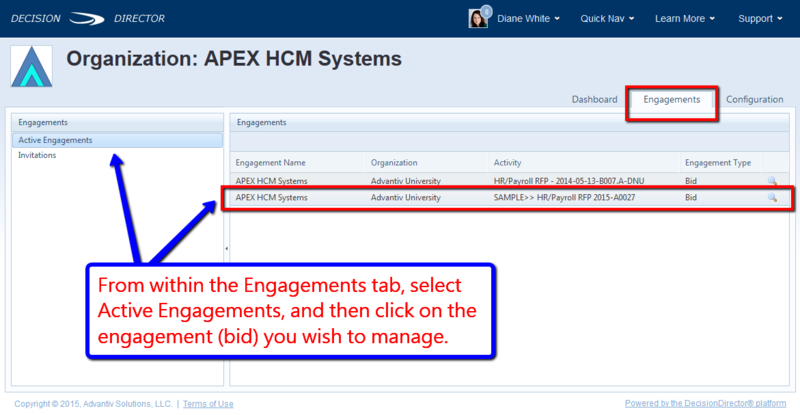 (See Managing Engagements (Bids) for an explanation of the Engagements tab). The Engagement Manager accesses the Participants tab on the Engagement record to begin the process of creating the Proposal Team. The Participants tab offers the option of adding respondents one at a time or as a group. 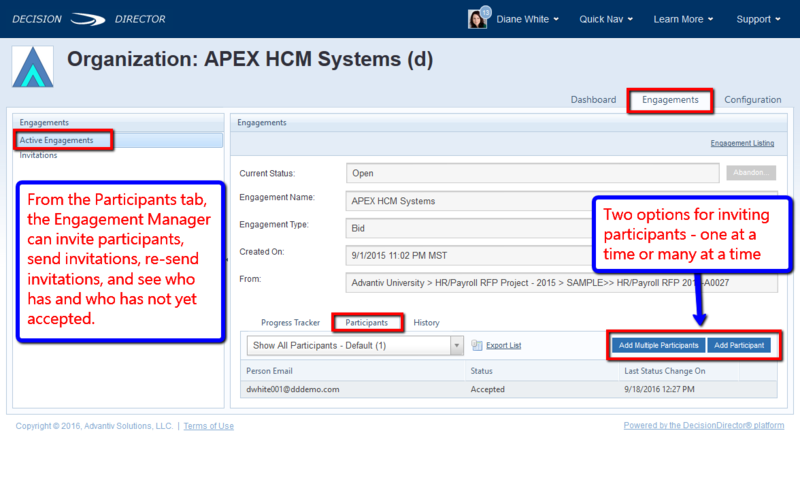 The Add Multiple Participants button makes it easy to add one or more team members to the RFP response. Click the button, type or paste in email addresses, and then click Continue. Note: Invitations are based on the person's email address. 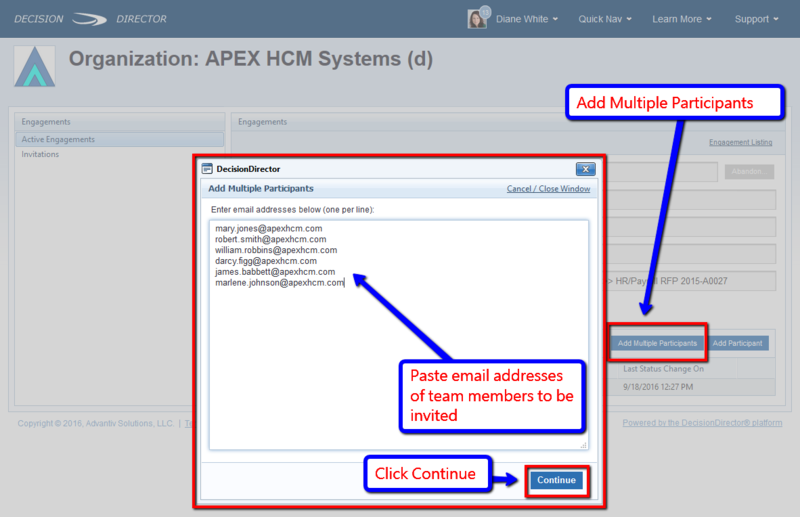 If the person already has a DecisionDirector account, it is best that you use the email address associated with that person's DecisionDirector account - otherwise, they may end up creating a new DecisionDirector account, or you may have to issue a new invitation to the correct address. 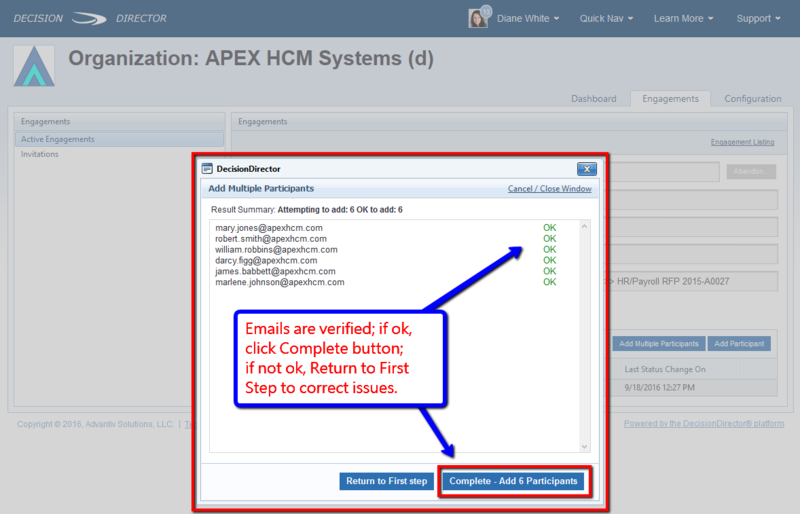 DecisionDirector will verify that the email addresses are valid and that the persons have not already been invited. 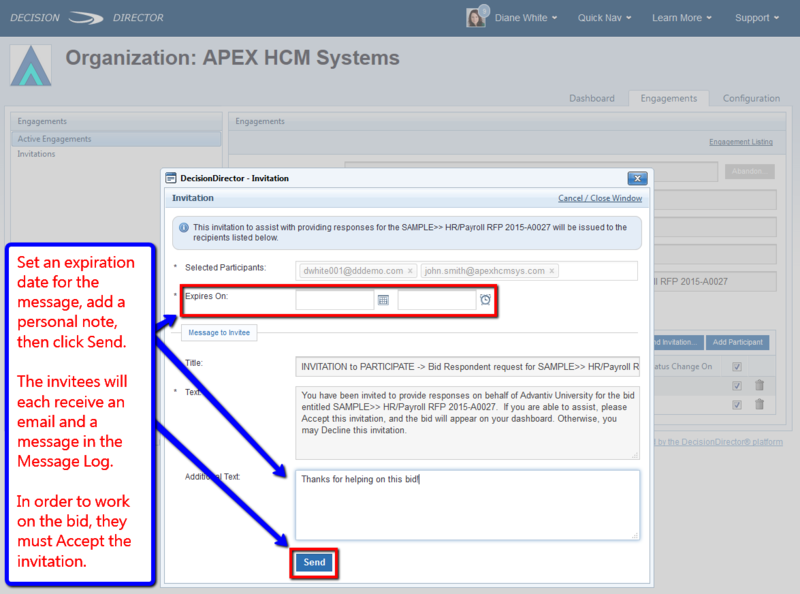 If everything is ok, then proceed by clicking the Complete - Add x Participants button. If there is a problem with any email address, DecisionDirector will provide diagnostic information. Go back to correct issue by clicking the Return to First Step button. 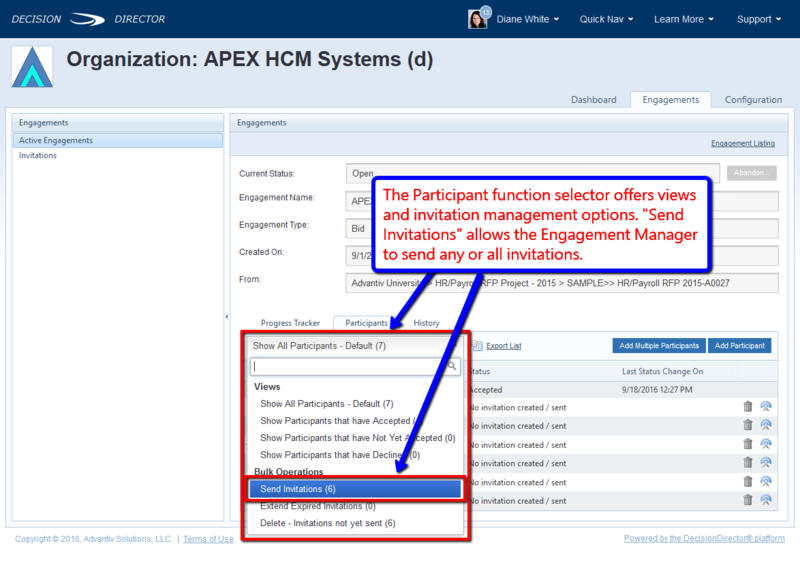 When the Participants have been selected, the Engagement Manager can issue the invitations. The following sequence of screens shows how this is accomplished. 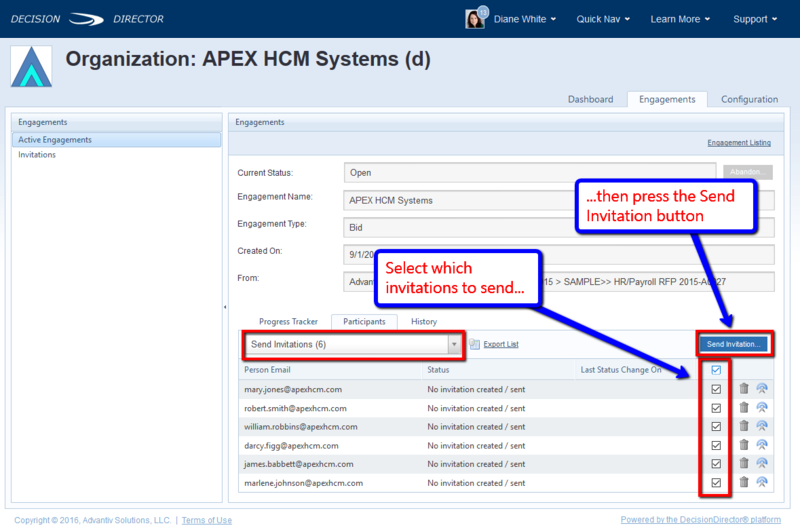 The Engagement Manager then completes the composition of the invitation message by setting an expiration date for the invitation and adding a note to be included in the body of the invitation message. 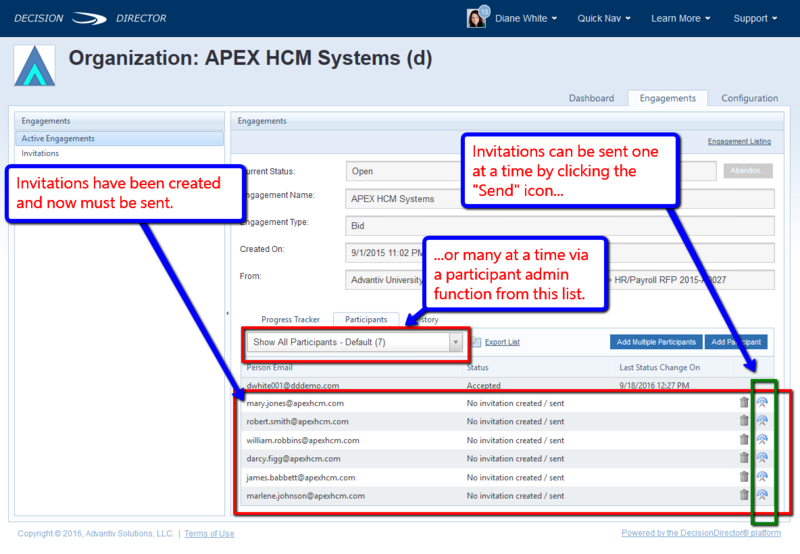 Clicking Send causes the invitation to be sent by email to each person, and for a message to be added to each person's DecisionDirector Message Log. Note: Each person MUST ACCEPT the invitation in order to be given access to the bid response activity.The Engagement Manager will receive a notice for each acceptance as well as each declined invitation. The Participants tab will also show the status of each person's invitation (Not Sent, Invited, Accepted, or Declined). NOTE: The expiration date of an invitation is not (technically) related to the due date for the RFP. The invitation expiration date determines when the invitation is no longer active, and the person who received it can no longer accept or decline. Most Bid Managers will set the invitation expiration to be a few weeks prior to the due date of the RFP. This is a good practice as it creates a sense of urgency and need for timeliness. Some Bid Managers will set the invitation expiration date to the same date and time as the RFP due date. This is not helpful as there is no reminder facility in DecisionDirector and, even if there were, accepting an invitation to join the response team at the last minute is unlikely to be very helpful.